Here’s a full-size version–click to enlarge it. 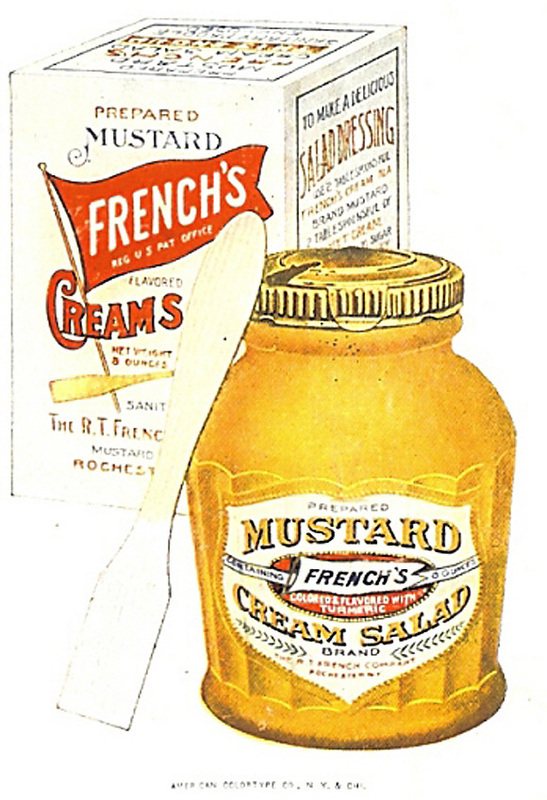 These inserts showed up in the original packages for French’s Cream Salad Style Mustard (which was the name for what we now call French’s Mustard from its introduction until around 1970, although other, similar mustards continued to use the term into the 1980s). To explain the name, we need to examine mustard, but since this is French’s story, let’s start with R.T. French. Robert Timothy French was born in Ithaca, New York in 1828, one of eight children in a family supported by his father Phillip’s furniture-making business. He worked at a tea and spice shop selling exotic imports like turmeric and paprika for most of his professional life, and during that time, he and his wife Frances had four sons together: George, Robert Junior, Francis, and Edward. In 1876, the elder Robert French (then 48) opened his own spice company, which eventually took the name French & Sons. While it sold spices, including mustard, it didn’t really prepare its own branded blends. In 1883, the 29-year-old George joined his father in the purchase of a flour mill in Fairport, New York that burned down a year later. The business was relocated to Rochester, where R.T. French would die in 1893 at the age of 64. See the last two boxes on the right? Those are to be ticked if the father and mother, respectively, were born outside of the United States. The second misconception is from Wikipedia, which, as usual, gets it wrong by stating that the Robert T. French who bought the mill with George French in 1883 was George’s brother, Robert Junior. Let’s put aside for the moment that this would mean the 21-year-old Robert Junior was supervising his 29-year-old brother; the page then says that George took over as company president when Robert died in 1893. Notice that Robert Junior is listed as a physician. Of the brothers, only George and Francis went into the family business. Both Robert Junior and Edward became doctors. Anyway, Francis joined the business sometime after his father’s death, with George now at the helm, and at this point, the only authority we really have on what happened next are company pronouncements, which generally credit Francis with the idea for a new type of mustard early in the 20th century. A brief culinary review of mustard: mustard seed was known to the Greeks, but it was the Romans who started the practice of cracking open the seeds and mixing them with grape juice to make a pungent, hot condiment. Over the years, as the preparation spread through Europe, the liquid switched to some form of vinegar, although in Dijon, they used verjus, the juice of unripe grapes. Verjus has a balance of sweet, tart, and sour flavors to it, making a mustard with more mustard flavor and more complexity than others. Along the way, as the Germans, French, and English all developed their own distinct styles of mustard, a few general principles emerged by the start of the 19th century. First was that the pungency of mustard was released when the grains were cracked or ground and then mixed with liquid; second was that the essential oils that give mustard its pungency would be spoiled by heat and time; and third was that acidic ingredients could delay the decay of the pungency somewhat; and finally, because grinding produces heat, coarser mustards would be hotter. As for that pungency, we’re exploiting the plant’s defense mechanism to our culinary advantage. The heat in mustard grains (and horseradish, for that matter) comes from two separate but equally important substances: sinigrin, which is an organic compound which has sulfur and nitrogen contained in a glucose and amino acid structure, and myrosin cells, which contain enzymes called myrosinases. In the presence of water, myrosinases can attract the glucose away from sinigrin molecules, causing them to degrade into something irritating that we call mustard oil but which has different composition depending on the acidity of the environment. If nobody touches your house, everything is fine–the sparky robot runs around in the closet throwing sparks, the gas sits in gas cans, and the firecrackers stay in their boxes. Everybody’s happy. But if something damages the walls of your house–an earthquake, a wrecking ball, a flood–and the toy robot gets out, it’s going to hit something that will convince the intruder to leave it alone. But what actually happens once the robot gets out is in a state of flux, and partially determined by the environment around the damaged house. Because the prepared mustards of the day were made in a way to preserve as much of the seed’s pungency as possible, they were used sparingly. But Francis French, as the story goes, had another theory: that people didn’t use much mustard because they just didn’t like it. So Francis and George set out to create a milder mustard that didn’t burn as much, using a finer grind of grain, different proportions, and for flavor and color, turmeric. Turmeric is a relative of ginger, and like ginger, it has some anti-inflammatory properties that may or may not cut the burn of mustard. 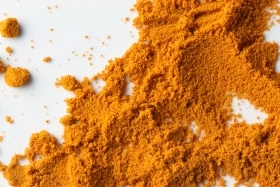 What’s beyond argument, however, is that turmeric is a highly effective orange-yellow pigment that turns the prepared mustard from its normal brown-ish color into something stunningly bright yellow. 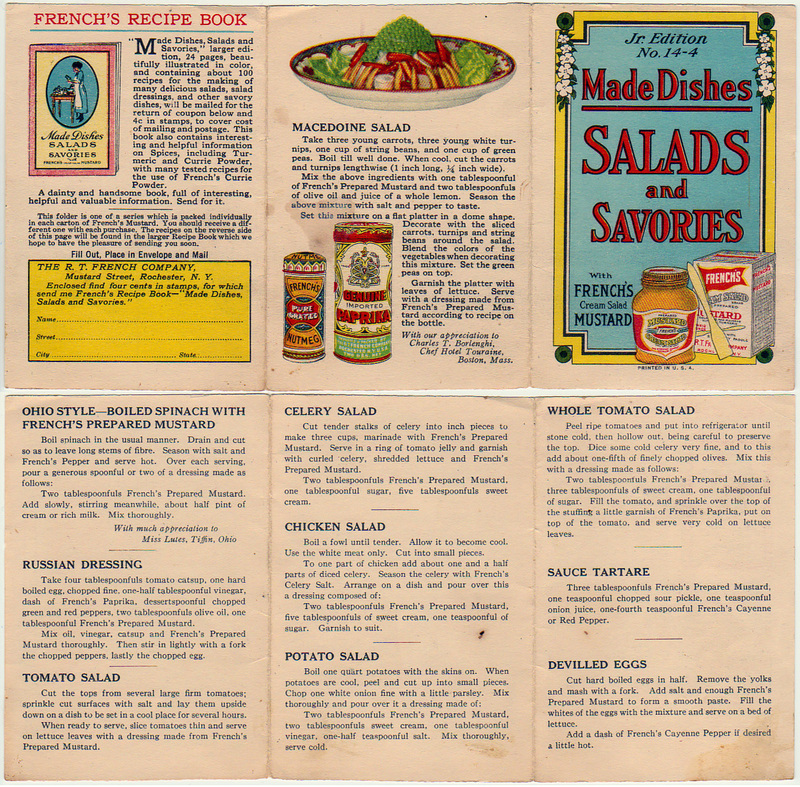 The brothers French brought their creation the 1904 World’s Fair where they marketed it as French’s Cream Salad Style Mustard, a mustard designed to improve the quality of your cream salad dressing that even comes with its own sanitary wooden mixing paddle! Which bring us to another bizarre statement someone’s tried to add to this story. Yeah, no. Given that the French’s site itself explains, “There are no ingredients in mustard that spoil,” that sounds like some pretty magical cream you’ve got right there. What cow did you get it from, David Blaine? Two eggs, three table-spoonfuls of vinegar, one of cream, one teaspoonful of sugar, one-fourth of a teaspoonful of salt, one-fourth of a teaspoonful of mustard. Beat two eggs well. Add the sugar, salt, and mustard, then the vinegar, and the cream. Place the bowl in a basin of boiling water and stir until about the thickness of rich cream. If the boil is thick and the water boils all the time, it will take about five minutes. Cool, and use as needed. And it’s probably not a coincidence that a cream dressing recipe was printed on the side of the box–look carefully in the image below and you’ll see the first step is to mix equal portions of mustard and sweet cream. Two tablespoonfuls French’s Prepared Mustard. Add slowly, stirring meanwhile, about half pint of cream or rich milk. Mix thoroughly. With much appreciation to Miss Lutes, Tiffin, Ohio. Take four tablespoonfuls tomato ketchup, one hard boiled egg, chopped fine, one-half tablespoonful vinegar, dash of French’s Paprika, a dessertspoonful chopped green and red peppers, two tablespoonfuls olive oil, one tablespoonful French’s Prepared Mustard. Mix oil, vinegar, ketchup and French’s Prepared Mustard thoroughly. Then stir in lightly with a fork the chopped peppers, lastly the chopped egg. Cut the tops from several large firm tomatoes; sprinkle cut surfaces with salt and lay them upside down on a dish to be set in a cool place for several hours. When ready to serve, slice tomatoes thin and serve on lettuce leaves with a dressing made from French’s Prepared Mustard. Cut tender stalks of celery into inch pieces to make three cups, marinade with French’s Prepared Mustard. Serve in a ring of tomato jelly and garnish with curled celery, shredded lettuce and French’s Prepared Mustard. Two tablespoonfuls French’s Prepared Mustard, one tablespoonful sugar, five tablespoonfuls sweet cream. 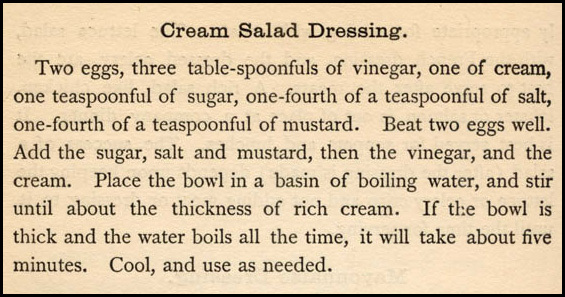 Two tablespoonfuls French’s Prepared Mustard, five tablespoonfuls of sweet cream, one teaspoonful of sugar. Garnish to suit. Two tablespoonfuls French’s Prepared Mustard, two tablespoonfuls sweet cream, one tablespoonful vinegar, one-half teaspoonful salt. Mix thoroughly, serve cold. Two tablespoonfuls French’s Prepared Mustard, three tablespoonfuls of sweet cream, one tablespoonful of sugar. Fill the tomato, and sprinkle over the top of the stuffing a little garnish of French’s Paprika, put on top of the tomato, and serve very cold on lettuce leaves. Three tablespoonfuls French’s Prepared Mustard, one teaspoonful chopped sour pickle, one teaspoonful onion juice, one-fourth teaspoonful French’s Cayenne or Red Pepper. Cut hard boiled eggs in half. Remove the yolks and mash with a fork. Add salt and enough French’s Prepared Mustard to form a smooth paste. Fill the whites of the eggs with the mixture and serve on a bed of lettuce. Add a dish of French’s Cayenne Pepper if desired a little hot. Take three young carrots, three young white turnips, one cup of string beans, and one cup of green peas. Boil till well done. When cool, cut the carrots and turnips lengthwise (1 inch long, 1/4 inch wide). Mix the above ingredients with one tablespoonful of French’s Prepared Mustard and two tablespoonfuls of olive oil and juice of a whole lemon. Season the above mixture with salt and pepper to taste. Set this mixture on a flat platter in a dome shape. Decorate with the sliced carrots, turnips and string beans around the salad. Blend the colors of the vegetables when decorating this mixture. Set the green peas on top. Garnish the platter with leaves of lettuce. Serve with a dressing made from French’s Prepared Mustard according to recipe on the bottle. With our appreciation to Charles T. Borlenghi, Chef Hotel Touraine, Boston, Mass. 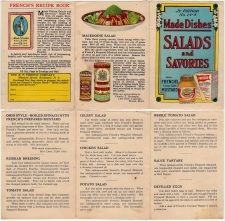 “Made Dishes, Salads and Savories,” larger edition, 24 pages, beautifully illustrated in color, and containing about 100 recipes for the making of many delicious salads, salad dressings, and other savory dishes, will be mailed for the return of coupon below and 4c in stamps, to cover cost of mailing and postage. This book also contains interesting and helpful information on Spices, including Turmeric and Currie Powder, with many tested recipes for the use of French’s Currie Powder. A dainty and handsome book, full of interesting, helpful and valuable information. Send for it. This folder is one of a series which is packed individually in each carton of French’s Mustard. You should receive a different one with each purchase. The recipes on the reverse side of tho spate will be found in the larger Recipe Book which we hope to have the pleasure of sending you soon.